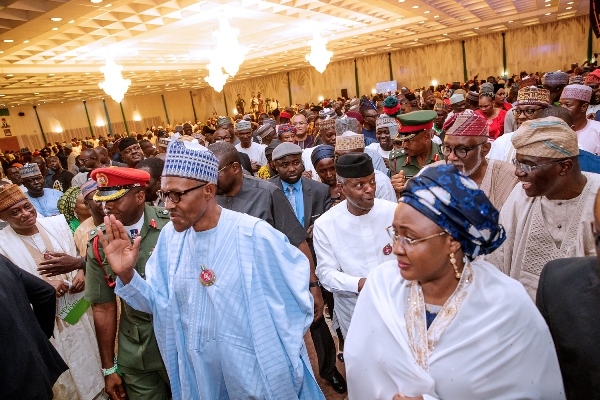 Some prominent Nigerian celebrities, including retired footballers, have pledged their support for the re-election of President Muhammadu Buhari. The celebrities made the declaration while receiving awards for excellence from the Wife of the President, Mrs Aisha Buhari in Abuja on Wednesday. She made the presentation during an event organised by the Buhari Support Organization tagged “Together Nigeria”, aimed at galvanising support for the re-election of President Buhari in the 2019 general elections. In their separate responses after the award, the celebrities declared their support for the re-election bid of President Buhari. Also speaking, Kosoko, said his support for President Buhari was unshakable, considering the successes recorded by the administration, especially in the area of social investment programmes.